The W-Series will support you with clever technology, valuable features and innovative services so you can work faster, more comfortably and efficiently – for top performance under all conditions. The large active separation area and the large 660 mm threshing drum increase the Performance without compromising on straw quality or fuel consumption. The DynaFlo Plus cleaning system with large shoe area ensure ultra-low loss levels and superb grain quality in the grain tank. In the front of the main threshing concave two removable concave parts are mounted which cover the first bit of the concave, and for which three concave types are available – small grain, universal and round bar inserts. The second part of the concave consists of a fixed universal concave grid which covers the remaining area. Field tests have shown that exchanging the concaves is worth the effort: moving from the universal section concave to small grain concave in tough threshing conditions delivers up to 12% more performance. Welcome to one of the most productive and comfortable places to work. With just 71 dB(A), the Premium cab version is one of the quietest in the industry. The W-Series’ spacious cab has a total size of 3.36 m³ (118.7 cu ft). It is loaded with a host of smart details to help you perform at your best while keeping you relaxed, even during long working days and under the toughest of harvesting conditions. Thanks to the tinted glass around the entire cab, the slimline cornerpost, and highly ergonomic control elements, you always have a clear view and are always in control. The cab was designed specifically for combines. With a total of 5.9 m² (63.5 sq ft) of glass in the front and to the sides, it provides an excellent view everywhere you need it, such as when unloading the grain tank. For extra comfort, a leather air suspension seat is available as an option. Even better, the hard-wearing leather seat is air-cooled, making even the longest of harvesting days easier. A leather-covered steering wheel providing a solid grip is also available. 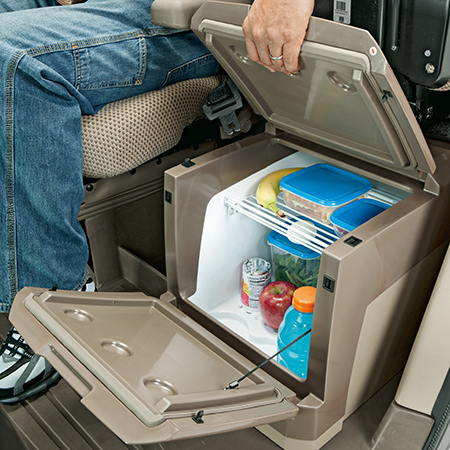 John Deere defines comfort down to the detail even when it comes to the refrigerator. With plenty of space and an impressive 37-L (1.3-cu ft) interior, it is perfect for storing large bottles in an upright position or a larger lunch box for a long working day. The fridge can cool down warm liquids actively and keep them cold during long days. The 660-mm (26-in.) cylinder guarantees gentle threshing with well-preserved straw and reduced grain damage due to its large-diameter, 10 rasp bar design, high oscillating weight, and the fact that John Deere combines thresh more by rubbing rather than beating. The open cylinder directs the dust into the machine and doesn’t force it out of the feederhouse, giving you a better view of the header. 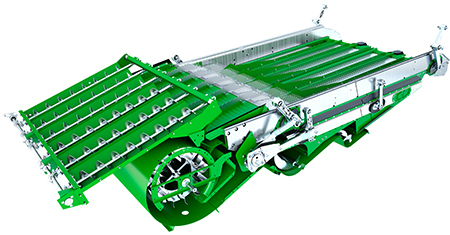 The quick-engage rasp bar ensures even more intensive threshing. The BoosterBar has been placed closer to the cylinder to produce more friction. It’s especially effective for threshing damp or difficult-to-thresh crops such as barley or bearded wheat. Even better, it doesn’t waste valuable separation surface, as the BoosterBar doesn’t minimise the concave surface. This makes it a real alternative to the existing deawning plates and should be the first choice in difficult threshing conditions. The large 660-mm (26-in.) threshing drum, the large concave wrap angle of 116 degrees, and the wide channel width of 1400 or 1670 mm (55.1 or 65.75 in.) (5 or 6 walker) enable the use of a large concave and rear beater area. Compare for yourself the active separation area of 1,5 or 1,8 m² (16.1 or 19.4 sq ft) (5 or 6 walker), according to ISO 6689-1:1997, to those areas on multi-drum threshing systems of the competition. Furthermore, the crop mat inside the wide channel is very thin and four rasp bars always engage inside the concave, which makes it much easier for the grain to escape through the concave compared to more narrow channels with less rasp bars engaged in competitive multi-drum systems on the market. 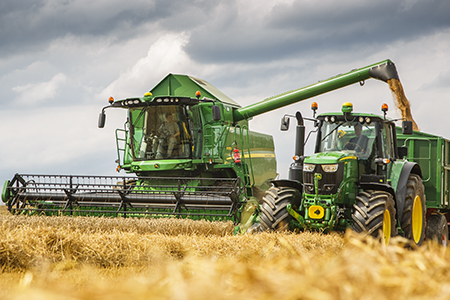 With this, John Deere is able to realize excellent performance levels in the W-Series market segment with very good grain and straw quality at low fuel consumption levels. 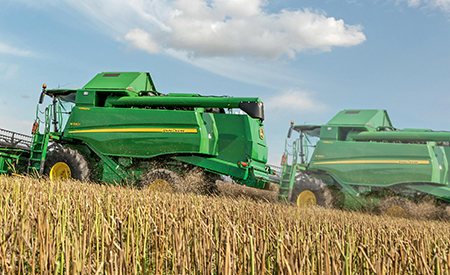 Like many of John Deere’s good ideas, this one came from you. 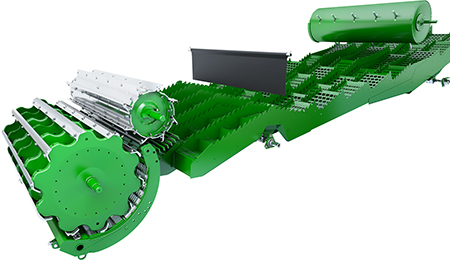 After several of customers reported significant performance increases with different concave configurations, we took that a step further and developed an updated sectional concave; finally, changing concaves is as easy as on a rotary combine. In the front of the main threshing concave, two removable concave parts are mounted which cover the first bit of the concave, and for which three concave types are available – small grain, universal, and round bar inserts. The second part of the concave consists of a fixed universal concave grid which covers the remaining area. Exchanging the inserts takes only 15 minutes thanks to the easy access through the stone trap. The booster bar can stay in place with its full functionality as the inserts slide over it. For you, it means that the conversion can happen when warranted so that compromises on performance or grain quality become a thing of the past. Field tests have shown that exchanging the concaves is worth the effort: moving from the universal section concave to small grain concave in tough threshing conditions delivers up to 12 percent more performance. At the same time, the universal concave is the best solution for grain that is easy to thresh but requires more separation capacity. Lastly, the round bar inserts minimize the amount of cracked kernels in corn, beans, and sunflower while maximising performance. The large walker area with 11-step design ensures excellent grain separation while maximising straw quality. After the main drum and concave, the rear beater drum and concave adds more separation capacity. It can be set in two positions: close to the rear beater for more separation capacity or farther away from it for more straw quality. The optional power separator drum on top of the walkers helps separation in wet conditions with high straw volumes. How can you considerably enlarge the sieve surface without adding any weight and reducing the oscillating weight? The developers at John Deere found an answer to that question back in 2015. The result: 41 percent more sieve surface and less weight at the same time. This was possible through an innovative, lightweight design and an aluminium structure resulting in reduced weight, which reduces peak engine loads and cuts down on vibration. 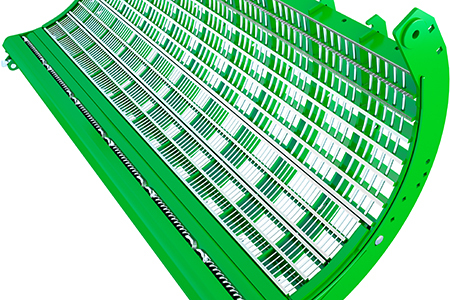 This means the harvested crop stays on the sieves longer, maximising cleaning time and minimising losses. The W-Series is designed for the highest capacity. The 5-walker combine has a total sieve area of 5.2 m² (56 sq ft) and the 6-walker has a sieve area of 6.3 m² (67.8 sq ft) according to ISO Norm 6689: 1997. 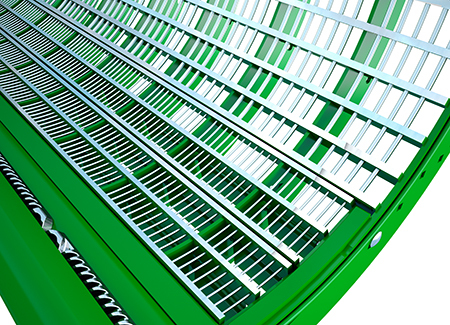 High-performance sieves prevent short straw from falling through the grid as they are equipped with special “noses." 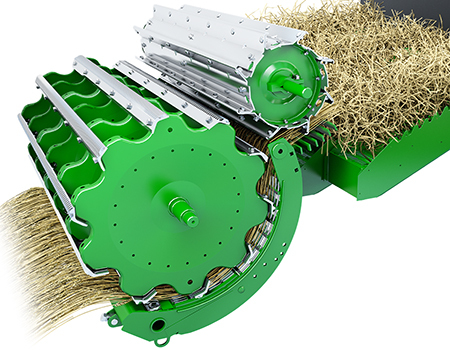 With its two-speed fan drive, the cleaning fan can be converted from crop to grass in a matter of minutes. Simply adjust the belt instead of having to swap the pulley. Our unique triple chute design increases cleaning efficiency thanks to the 41-cm (16.1-in.) cascades, of which 21 cm (8.3 in.) are ventilated to separate 40 percent of the chaff from the grain before it reaches the chaffer. Through intensive testing, we have found the right balance between air pressure and air volume. This provides the perfect pre-separation effect and evenly divides the material between the front and rear part of the chaffer. Through intensive testing, we have developed an updated combine cleaning system which is resistant to adjustment errors. For optimum results in changeable conditions, it does not need to be constantly readjusted, making life considerably easier for the operator. The sieve, with its considerably large surface of 5,2 or 6,3 m² (56 or 67.8 cu ft) (5 or 6 walker), offers high cleaning performance even under severe conditions. The W-Series helps save valuable time even with unloading. A great feature in this class, the up to 11,000-L (312-bu) capacity grain tank can be unloaded in record time: up to 125 L/s (3.55 bu/sec). 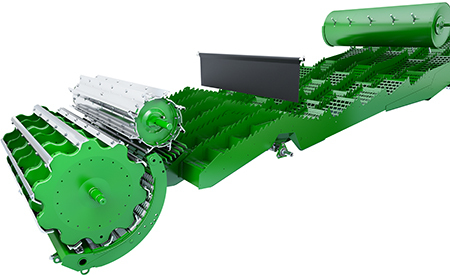 The large-diameter unloading auger turns with low rpms and is therefore gentle on grains. A special focus is also on grain quality and making unloading on the go as easy as possible. The large-diameter auger turning at low rpm prevents grain damage while unloading. The cross auger cover plate for the grain tank can be adjusted without the need for tools, so the unload rate can be altered quickly for different crops. Visibility is excellent, too. With a large rear window, you always have a clear view into the illuminated grain tank, and you can always take a sample from next to the cab. The optional Harvest Monitoring and Documentation system accurately measures yield and moisture via sensors. Relevant data is displayed in the cab and can be recorded on the optional GreenStar™ 3 2630 Display and can be transferred to the Operations Center on MyJohnDeere. com – either manually via USB device or automatically via Wireless Data Transfer (WDT). 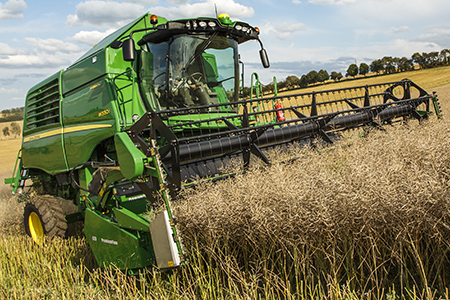 The electronic engine management provides up to 25-kW (34-hp) extra performance during unloading while driving so you can continue harvesting with full power. The optional wireless camera kit transmits the picture to the monitor of the tractor driving nearby. With John Deere Machine Sync, the combine operator can have the tractor with a trailer drive alongside the combine while unloading. 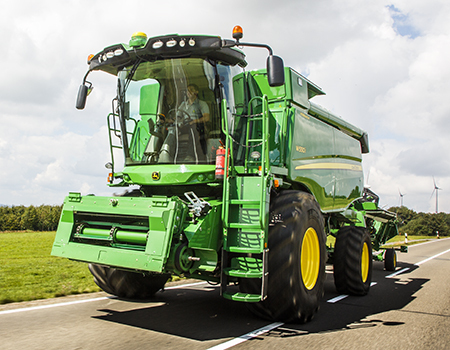 Once in position, the combine operator can control the ground speed and steering of the tractor-trailer combination. Grain trailer operators can see the grain tank levels of several combines and can be called to empty the fullest tank. This saves time, diesel, and nerves and minimises soil compaction. 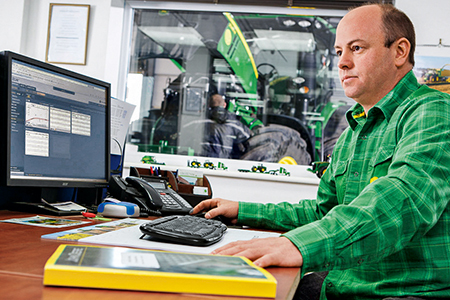 Leveraging the machine-to-office connectivity, a John Deere dealer can (with your permission) maximise machine uptime. For example, he can remotely check machine health and identify potential issues before they actually stop you from working. 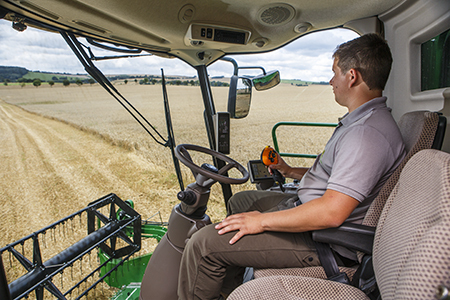 With Remote Display Access, you or your dealer have a live connection from the office to the GreenStar™ 3 2630 Display on the combine to assist the operator with machine setup and operation – without the need to drive out to the field. The Operations Center on MyJohnDeere.com is the hub of all your data. Store field locations, track the progress of machines, assign work orders to operators, view yield and moisture maps, as well as create, analyse, and share harvest reports with trusted advisors and customers. What’s more, you can access it from any internet-enabled device. With the satellite-based, hands-free AutoTrac system, every pass matches the full cutting width of your platform. This helps save time and fuel and boost combine performance – even at night, in dusty conditions, on hillside terrain, and after long hours of operation. 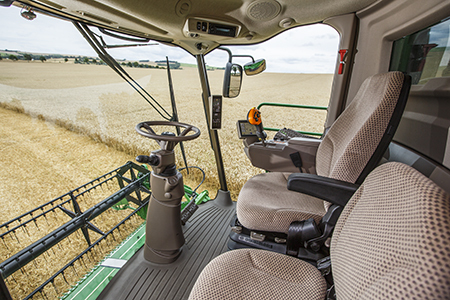 The automatic steering relieves operators and allows them to concentrate on their yield. When working with multiple machines in a field, the AutoTrac guidance lines can be shared from one machine to another so that all combines can harvest at the full cutting width. They can also be shared with the tractor or grain trailer operator so the machines can drive exactly parallel to each other during unloading. 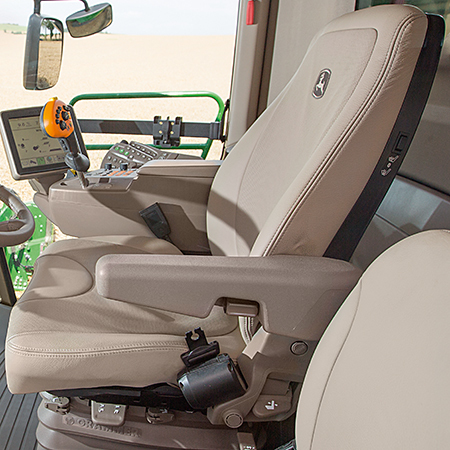 AutoTrac RowSense™ system adds even more comfort and productivity to corn harvest. 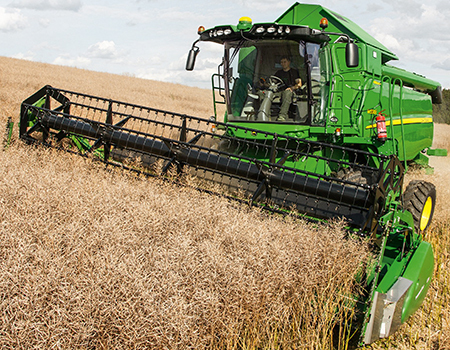 It merges global positioning system (GPS) based automatic steering and row guidance – leveraging row feelers on the header – to increase harvesting speed. When row feeler information is not available (for example, in down crop situations), the GPS signal takes over. 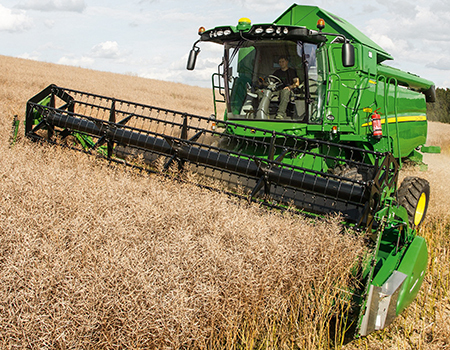 Independent studies have shown that ICA improves the utilisation of the combine’s capacity by up to 20 percent*. ICA lets you select one or several areas for optimisation and the interactive tool suggests settings based on your priorities (losses, clean grain tank, broken kernels, straw quality, etc.). It even suggests adjustments to the combine’s hardware. Standard on all models within the series, Harvest Settings helps you effortlessly transition between crop types. 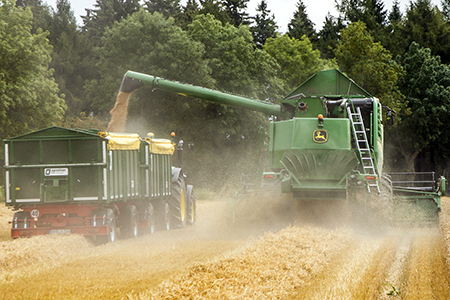 By using standard John Deere values and retrieving data on your current threshing and separating conditions, it automatically adapts your machine to optimise its performance. You can then use these proposed values or modify and save them for later use. Once the material reaches the cleaning shoe, the real innovation shows. The whole shoe is longer than before and also longer than comparable concepts from other brands. This means the crop stays on the chaffer and sieve longer. The longer it stays, the more time it has to be separated and the less chance of it going out the back of the combine, which reduces losses. This technology allows operators to cover slopes of up to 7 percent. 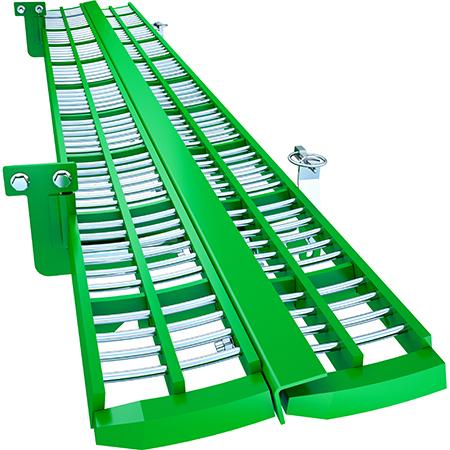 The sidehill performance package contains chaffer dividers, grain agitators, and grain pan diverters. These prevent grain from accumulating to one side and help distribute it over the full width of the chaffer. The agitators actively move grain uphill with every stroke while the dividers and diverters prevent grain from moving downhill on side slopes. Together with the in-base technology at the cleaning shoe, you can be confident of harvesting in slopes up to 14 percent without any compromises or grain losses. This simple and reliable solution has no moving parts either, so it’s maintenance and wear free. We don’t like compromises and we know the physical limits. That’s why we offer HillMaster for the W-Series, simply because it is the best solution for steep slopes. The HillMaster system not only adjusts the chaffer and the cleaning shoe, it levels the whole combine from the feederhouse to the chopper. HillMaster also has the added benefit of keeping the weight distribution even. Without it, the wheels on the downhill side of the combine would experience more load which would increase soil compaction. 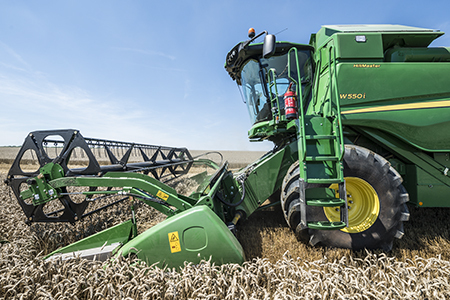 By levelling the whole body of the combine, HillMaster shifts the centre of gravity so there’s even ground pressure across all four wheels. This also ensures that the combine has better traction and stability on slopes, an important consideration in unstable or wet soils. Spend more time harvesting and less time travelling between fields. With its automatic ProDrive™ transmission, the W-Series allows speeds of up to 40 km/h (24.9 mph) on roads. Optimised hydraulic pumps and engines provide more pulling power for the front and rear axles, while the hydraulic power steering makes turning easy. The intelligent engine speed management system reduces engine speed on roads, saving fuel. The overall width, including 680-mm (26.8-in.) tires, is a slim 3.5 m (11.5 ft) for the 6-walker and just 3.3 m (10.8 ft) for the 5-walker. Choose from different types of transmissions suiting your individual needs. Options include the simple and reliable mechanical three-speed solution for those spending most time in the field, the electric three-speed for those who travel on the road more often, and our infinitely variable hydro-mechanical ProDrive transmission for the ultimate in comfort and pulling performance. The electric three-gear transmission and electric park brake make changing gears child’s play. Gears are changed via easy-to-use buttons on the CommandARM™ console. For the utmost efficiency on all terrains, the ProDrive transmission is the perfect answer, putting an end to shifting on hills or on the headland. The Infinitely Variable Transmission (IVT™) automatically shifts between gears while you continue to harvest at a constant speed. Increased torque and the manual differential lock ensure top performance in challenging conditions. Whether on wet ground or on the road to the next field, the W-Series tires deliver a host of advantages. Benefit from a large footprint, lighter ground pressure, excellent driving comfort, rapid road speeds, and a slimmer transport width. With their increased footprint, these tyres reduce ground compaction without increasing transport width. The 680/75R38 tyres also offer superior ride comfort and stability. The 680/85R32 tires offer a larger ground contact surface and produce less ground pressure than 710-mm or 800-mm (28-in. or 31.5-in.) wide tires with smaller diameter. A John Deere exclusive, traction is controlled automatically, ensuring stability even in the toughest of conditions. Thanks to this concept, even bad weather can’t stop you from bringing in your crop. The rear axle with an increased steering angle of up to 33 degrees enables tighter turns. The updated steering cylinders require less effort to turn the steering wheel. We will provide a backup machine if parts are delivered too late. There is no payment or complicated paperwork required. We’ll take care of everything. What makes a difference is that we are not just paying a contractor. We physically have combines in the right amount and the right size on reserve at the dealership to make our promise come true if needed. 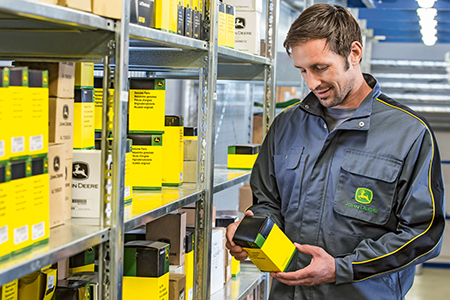 John Deere’s parts network is one of the biggest in the agriculture business. With more machines in the field than any other manufacturer, we hold more parts in stock than anyone else. It all means we consistently deliver more than 97 percent of all orders within 24 hours. So whatever the challenge, you can rely on us to keep you moving. If the part is not in dealer stock, we have regional parts warehouses in Sweden, the UK, and our main European Parts Distribution Centre (EPDC) in Germany. Open 24/7, the EPDC is the size of eight football pitches, stocking more than 275,000 parts from a knife bolt to a 10.7-m (35-ft) combine auger. Order to shipping takes less than 2 hours thanks to our advanced logistics and packaging systems.